Buzz Words: Shiver Me Timbers! This is the tale told in a rhyming text of a fearsome pirate crew , including a chorus of ‘rolling waves and the words ‘ho ho ho’ repeated on each double spread. 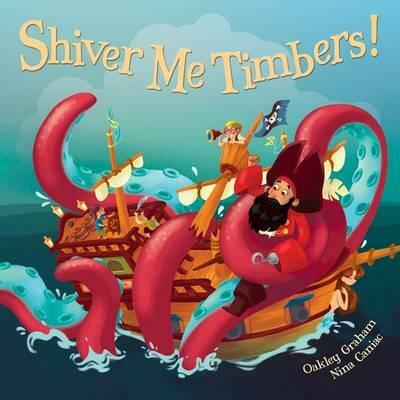 In a book for young children who will love to listen to the story told aloud, Captain Black and his pirate crew go looking for treasure in a swashbuckling, sea shanty adventure on the high seas. The story highlights aspects of the life of pirates from obedience to Captain Black, chores, doing a poo overboard, giant octopus and the demise of Captain Black. Details such as these are followed at the end of the book by facts about pirates of the seventeenth and eighteenth century. The placement of the text is sometimes used to emphasise an action, for example, the words, ‘He likes to use his whip,’ is curved and swirls across the page. The vibrant illustrations are full of movement, with an interesting use of different pictorial formats and emotional communication often shown through the pirates’ body language.